Given all the lip pencils I’ve been showcasing this week, I thought I’d wrap the week up with another lip product! This amazing lip formula combines the luxurious feel of a lipstick with the ease and convenience of a jumbo, crayon-inspired pencil. Includes a complimentary custom-sized sharpener. This is essentially a creamy lip stick in a pencil format. It is very hydrating with a high sheen finish. Although scentless, there is a slight peppermint taste that fades after 15 minutes or so. In a thick pencil format- it seems to give better precision with application although there is the need to sharpen when the product gets blunt. Luckily, this custom sized pencil comes with a fitting sharpener so there is no hassles of looking for one separately. It feels ultra luxurious upon application, is very moisturising (thanks to the shea butter) and perfect item for dryer lips as it is very forgiving and don’t highlight flakes. Wild Rose is a mid warm rose pink. 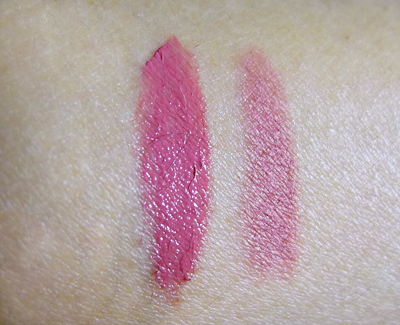 I thought it might look similar with MAC Dervish lip liner but when swatched side-by-side, you can see that dervish is more beige based and cooler in tone than wild rose. I really like the shade on my lips and another office friendly hue. This shade will compliment all but the darkest skin complexions to bring shine and colour into lips. 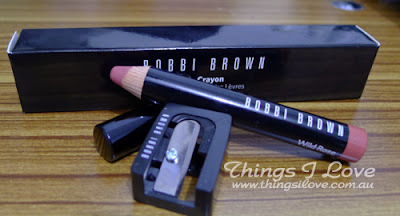 This is yet another beautiful colour and product wise from Bobbi Brown. 2.49g RRP A$44 | US$22 at Bobbi Brown counters. Available in 6 shades. 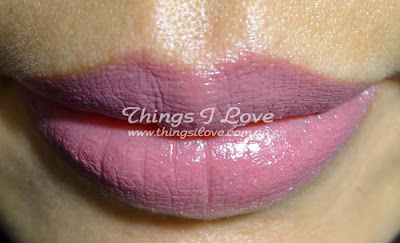 I love this lip crayon in wild rose color, but i heard it's been discontinued. Do u know where i could find them? look forward to hearing from you. I bought mine from the local Estee lauder staff staff shop (which is where the discountinued products go) so not sure where to actually get it from in retail anymore. I think your best bet is to try online outlets (like strawberryNet or ebay with discountinued items unfortunately).